We are thrilled to present the video component for our latest tune, “Barbarous Relic”! 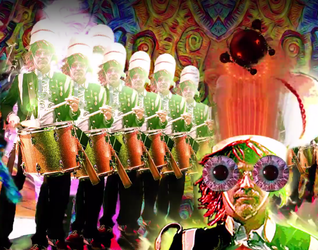 Both the song and video represent a giant leap into new realms sonically and visually, with a joyous bombardment of the senses, taking you into wildly unpredictable territory where bass drums give birth to flaming eyeballs, the sousaphone paints a psychedelic sunset and geometric visions from parallel realities seem to appear everywhere. Directed by our talented pal Matthew Shelton. MUCCA PAZZA: THE BACK-TO-SCHOOL TOUR! Hey Chicago, we're playing Martyrs', just like old times! We could not be more excited to share the bill with Slavic Soul Party!, New York’s Official #1 Brass Band and one of our absolute favorites. It will be a party to remember, so put on your dancing shoes and come join us! Eastern Illinois University, we’re marching your way! We’ll don our fancy pastels and sit down for the first half of this elegant evening, and then march all over the beautiful architecture of this gorgeous hall during the second half. See you there! We are honored to perform our first show in the greater St. Cloud area in an auditorium named in honor of Sister Firmin Escher, OSB, "an early and forceful advocate for the arts." Tell your St. Cloud friends to float on over! Exsqueeze me? Did someone say the turquoise/fuschia logo tee is back in stock in our webstore?! Just in time to start the school year! Sharpen your pencils and don your Mucca Pazza t-shirt.